News reports and social-media posts suggest that dozens of teachers across Iran have reportedly refused to appear in classrooms. Instead, they appear to be staging sit-ins to protest low wages. Evidence suggests the October 14-15 protests have taken place in more than a dozen cities and towns, including Tehran, Isfahan, Shiraz, Mashhad, Kermanshah, Sanandaj, and Ilam. RFE/RL could not independently confirm the reports. But word of the purported strikes follows a call by the Coordinating Council of Teachers Syndicates in Iran (CCTSI) for teachers to go to schools on October 14 and 15 but to refrain from teaching classes. The council said the two-day strike was being launched to protest "unfair wages," "degradation of education quality," "inflation," and "the continuation of the arrest of [teachers rights] activists." Several Iranian teachers, including Esmail Abdi, Rasoul Bodaghi, and Mahmud Beheshti, are serving jail terms for union-related activities and for calling for increased rights. The council said teachers in Iran have for years suffered from "painfully low wages" even as their purchasing power has fallen due to "out-of-control inflation and [rising] prices." Many Iranians are struggling to make ends meet due to a surge in prices of food staples and other goods brought with the national currency's value plummeting in part, at least, due to renewed U.S. sanctions. According to official government news agency IRNA, teachers' salaries are between 4 million and 13 million rials, which would put the minimum salary at around $100 according to the unofficial exchange rate. Striking teachers have also said that educational standards are dropping. On its channel on the communication app Telegram, the council posted photos of teachers in various cities who it claimed had joined the protest. Some were holding signs, stating the date and place of their protest. One photo showed several women sitting around a table where a handwritten sign said, "Sit-in by colleagues in Amol." Another photo showed 10 men standing outside the Persian Gulf Conservatory in Torbat Heydarieh, in Razavi Khorasan Province in northeast Iran, according to the official sign seen on the building. They were holding signs, including one that said that people are entitled to their rights. Photos and videos of protesting teachers were also shared widely on Twitter, with hashtags like #teachers_sitin and #nationwide_strike. 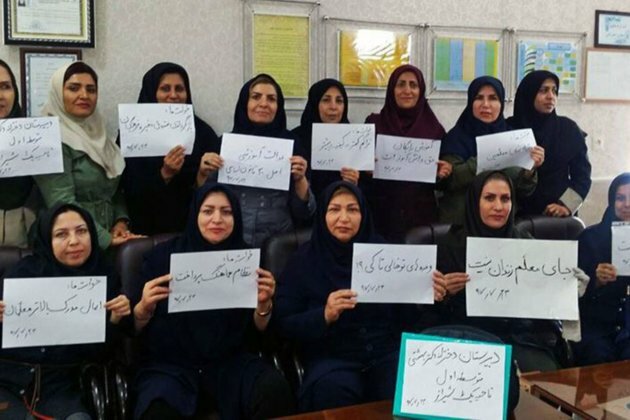 Sedighe Pakzamir, a member of the board of directors of Tehran's Teachers Association, posted several photos on her Twitter feed that she said showed sit-ins by teachers in Shiraz, Ilam, and Khoramabad in western Iran. Social-media posts suggested that some teachers had staged solo protests. A teacher identified as Hamid told RFE/RL's Radio Farda that many teachers have to work two or three side jobs to make ends meet. Speaking to the Persian Service of the BBC, a teacher identified as Reza said many teachers are in dire straits. Sporadic protests and strikes have been reported since late last year in relation to Iran's flagging economy. In late December and early January, thousands took to the streets of more than 80 cities and towns across the country to protest rising prices, unemployment, and corruption. "Different social groups are protesting against the country's current conditions. Naturally, teachers are doing the same," a member of Tehran's Teachers Association who had been detained in the past told Radio Farda. He asked not to be identified for fear of being arrested once again.